by J. T. Dixon for "The Evening "Star." The discovery of gold at Coolgardie (now called the "Old Camp") led to many new games being played where some few months previous to Bailey's arrival, I suppose the only visible kind of sport would be a grasshopper fight, and then only if there had been rains in the early spring. However, in 1894, the first Australian football was played on these fields; and Coolgardie can be credited with having the first team of ballers in this part of the State. Here are a few names of the good old sports who introduced the game and. were great supporters: —Messrs. W. Faahan, Geo. Purdy, Ted Ivory, Tom Cunningham, ''Jack' Boileau, H. McCormack; and 'Smallpage; perhaps a few others -whom I forget also helped to build the game up. Of a Very Delicate Nature. Trying to Raise the "Wind"
now for football! Fancy being able to raise £250 at present from supporters on the fields! In passing, one can say the amount raised. as expended, plus what it cost Jack Boileau out of his own pocket, or in those days Jack could "Go" On the teams return they played a game at Hannans (now Kalgoorlie) on the occasion of the opening of the Kalgoorlie Brewery. 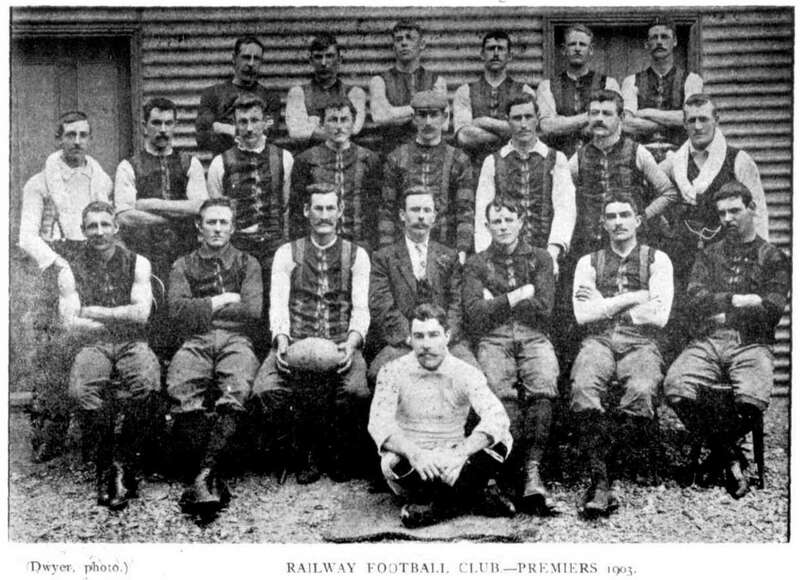 In 1896 the rovers won the premiership, going the full season without a defeat. The best men for the Rovers were Vic. Watts, O. Hyman, Rowell, “Bob" Robbie. Caulfield and James. 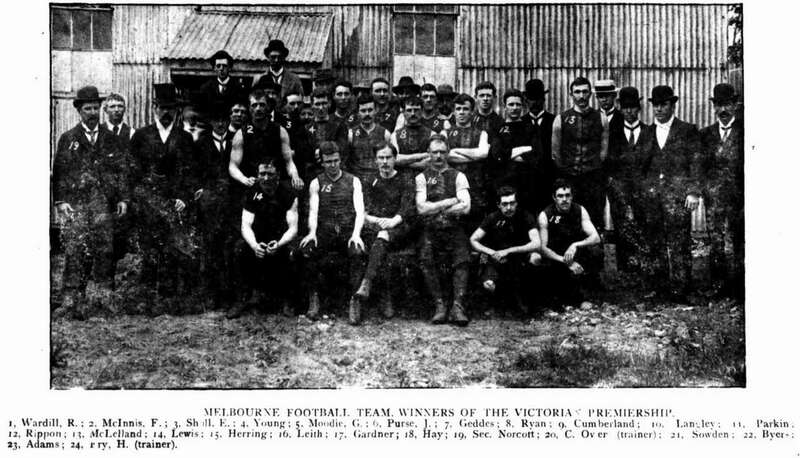 Albert Schwann (afterwards a fine umpire for the Goldfield's Association), H. Beaton, Seymore, Smith, -and Myers for Hannans, who won the premiership. In 1897 there were seven teams in the Association: White Feather, Brittania, Rovers, Boulder, Bulong, Victorians, and Hannans. A sad ending to this season was the death of a number of the premier team as the result of a pneumonia epidemic. For the Rovers the best men were Whelan, Banner, "Jack" Tyson, "Sandy' Hyman, Riley, Sandy, Adair, McQuarrie, Roberts, C. Gregory, and Ernie Leighton. For Hannans "Punch" Liddlelow, "Sis" Graeme, M. Fox, McIntyre, "Jim" Cullen, J. Bowe, "Carbine" "Gnllen, R. Gullen, Atherton, and Alex McKenzie. and players were brought from all parts of the Commonwealth. The final match for the premiership was played between Hannans and the Rovers, the scores being 7-16 to 8.2. There was a deal of dissatisfaction over the result, and after a few days the teams decided to play again. This game caused a good deal of interest and after a great battle the Rovers won by 7 points. Vic. Watts, A. Williams, Oscar Hyman, Jack. Leckie, "Briggs” Jennings. “Barry” Wells (still playing good football in Victoria), “Tack” Metherall, E. Sloan, J. Charnley, J. Rouke for the Boulder City club. In my previous article I mentioned a number of fine players. At this time the first of the inter-association matches were played, and resulted in a win for the Hannans Association, but he second match played at Kanowna was of such a suspicious character in the last quarter that it was subsequently declared "No Match." "The result was that these contests ceased for a year or two- The Boulder won the premiership this season, and they were a fine "side." He same year the Bonnivale team won the premiership at Coolgardie. In the 1900 season a dispute arose between the Boulder City and the Hannans Association, and in consequence the Boulder City Club were disqualified for one year. (A record for Australia at that time, for I cannot call to mind any other club that ever had such a severe penalty imposed.) In those days there was just about the same amount of club interest shown as is shown at the present time. 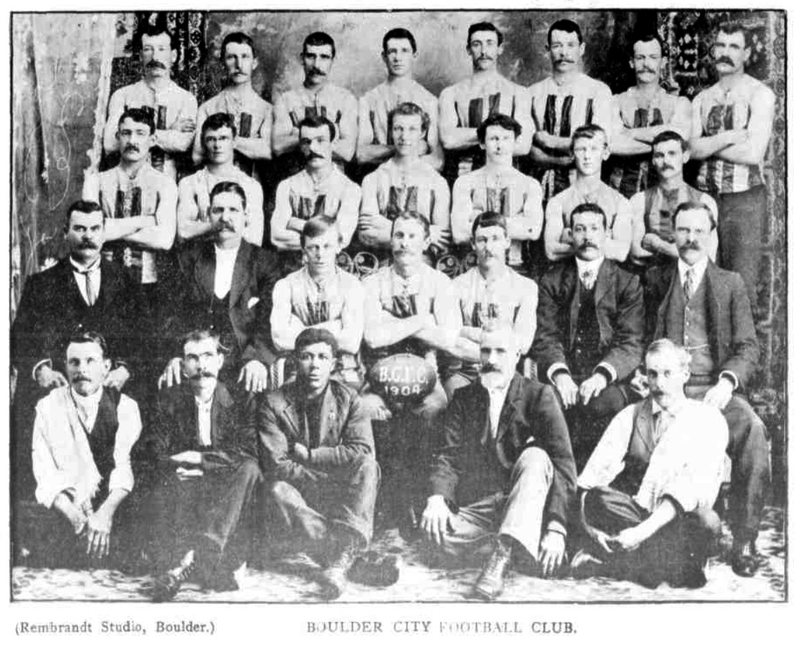 It was a matter of one club fighting the others, especially if it was a good club, as no doubt Boulder City was. 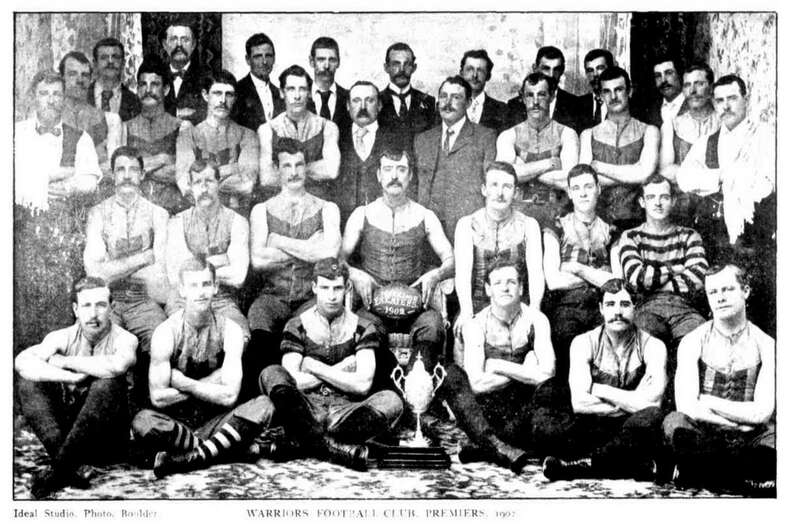 The Mines Rovers, which included some resolute players, won the premiership during this year and the following years. 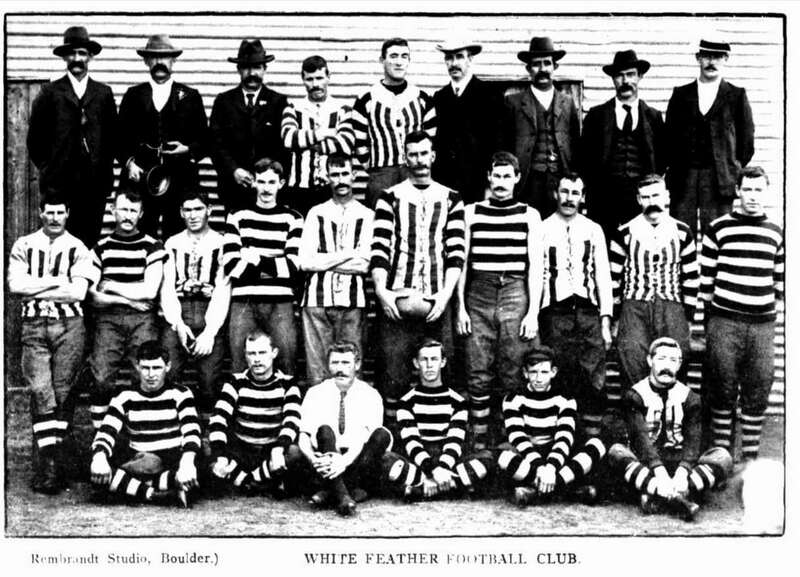 In 1901 an association was formed at Boulder, and several of the (City's players were distributed among the new clubs, which comprised the White Feather, Kanowna. Boulder, Warriors, and Mines United clubs. 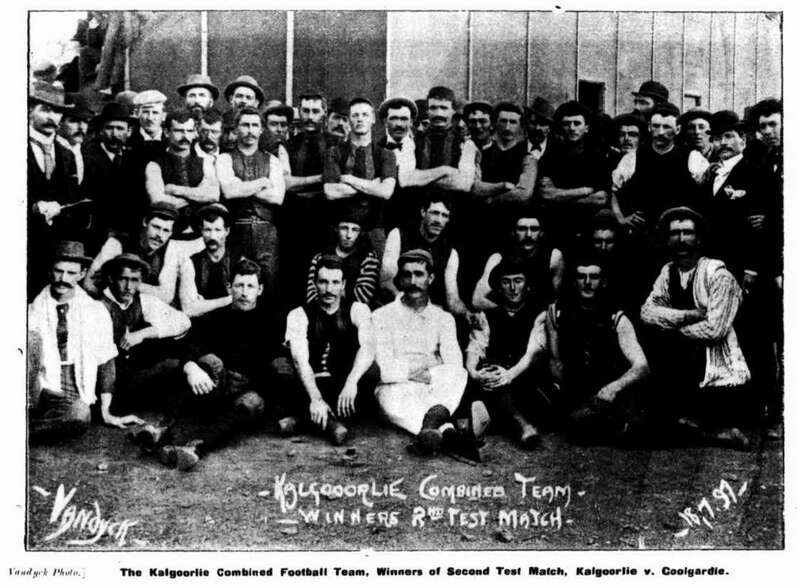 At this time Coolgardie sent a team into the association, which was called the Goldfields Association, which assumed the government of the game on the fields. 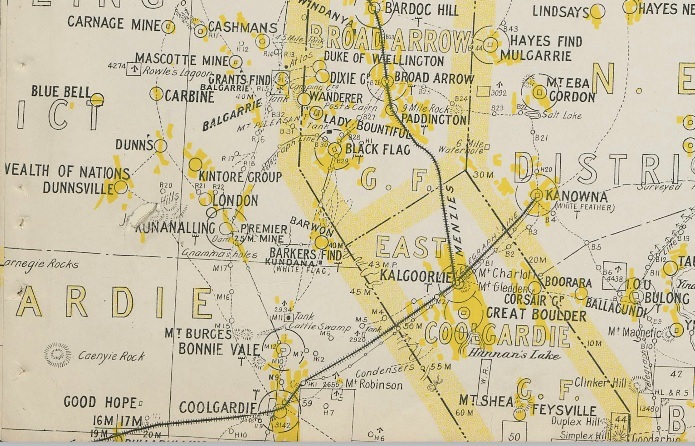 The following clubs joined the association; - Mines, Trafalgar, Coolgardie, and Kalgoorlie (late Hannans). 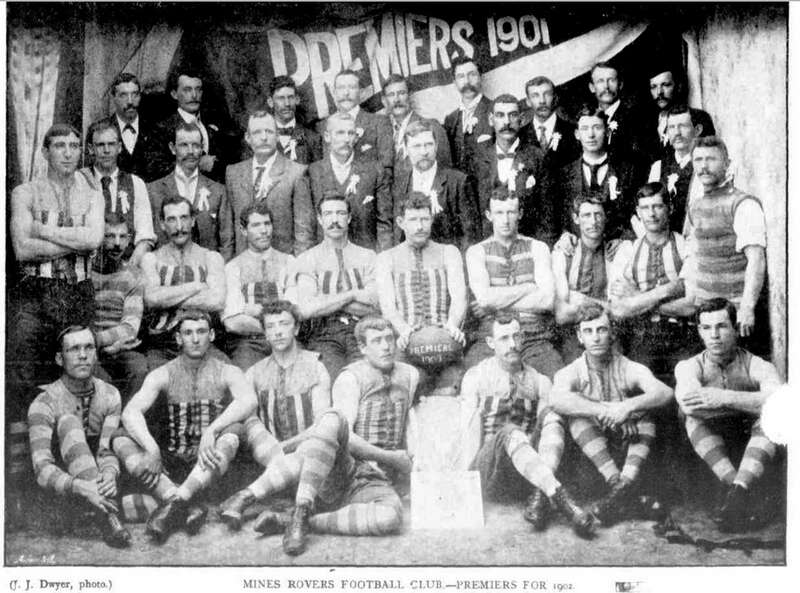 The Mines club again won the premiership, at that time the best team in the State, appropriated that of the Boulder Association. The Warriors visited the coast at the end of the season, but were beaten by East Fremantle, 12-16 to 4-5. The next season the Boulder association did not form, and the Warriors, Boulder City, and White Feather clubs joined the Goldfields Association. Trafalgar’s best were: A.Orr, A. Nelson, Keast, Dean, Iles, Campbell, Lock, Walker, Mann, Butles. Coolgardie, W. Gray, J. Kearney, E.Walton, F. Plumm, P. Sheedy, Woodlands, Treveavan, J.Bryant, J. Jarvis, Griffiths, Ogilvie, and J. Spargo. Kalgoorlie’s best were Bowes, Caulfield, Daly, Scott, Temby, Bennitt, Danials, Krby, Adams, Edney, Brady and Baker. White feather’s best were Cunningham, “Whopsy” Whelan, Dunlop, Pysing, Fullarton, Hampton, Nolan, Jenkyn, Partridge, Farrell, Johns, Taylor, Keegan, Ted Rowell, the second best forward who played at this time, Thurgood, or, as he was known “Albert the Great” being the first and only champion we have ever seen. Rowell and Quinn left for the east at this time, and Rowell played some fine games with Collingwood, while Quinn played for Port Adelaide, and they both proved two champions in their respective clubs. A strange thing that these two players met each other, both being “flat out”. The exhibition shown by them was a real treat. The series of articles remained incomplete. Possibly because of the charges of stealing against the author. 1. Your contributor states that Boulder City were disqualified for. one year, viz., 1901. ; Seeing :that the. disqualification was imposed early in the season 1900, and was for the "balance of that, and the whole of the following season, this could be called eighteen months. 2. In 1901 Boulder did form an opposition association of four, teams. No such team as "Mines United" existed, if my memory serves me rightly, and I was present at the Court Hotel when the association was formed. 3. Your correspondent's article states that Railways first joined the association ranks in 1901, whereas they had a team in the competition in season 1900, and were pronounced winners on one occasion only during the season. 4. In giving the names of players representing the various clubs at that time O'Connell and Hall are stated to have played with Boulder City, whereas "Honesty Sack" and "Rickety" Hall were staunch supporters and players of the Kanowna club. 5. Mr. Dixon states the Boulder Association did not form in 1902. They did, but losing Trafalgar, who decided to join the registered body, "they lost" a local ground, and were reduced to three clubs. 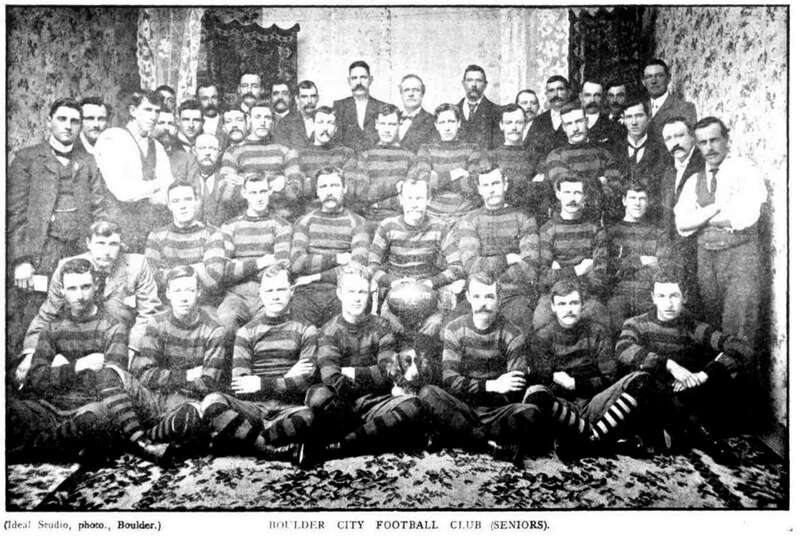 This caused their undoing the following year (1903), Boulder City and Warriors were also admitted in the ranks of the association 1903, and seven teams fought out the premiership. 6. If the W.A. 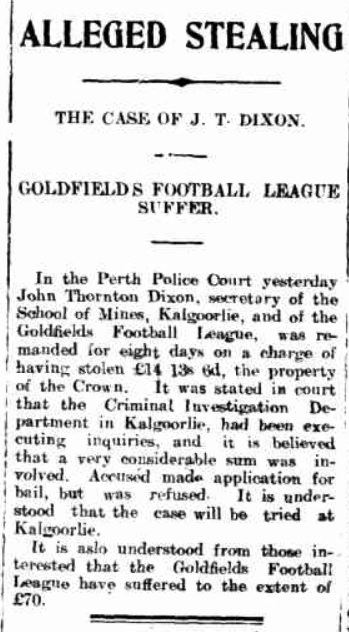 goldfields, as stated by your correspondent established a record in disqualifying Boulder City, they, however, equalled the performance a year or so later when they suspended for a term the Kanowna club, players, and officials for purloining the gate receipts of a match played at Pugtown between Kalgoorlie and Kanowna.